Gigabyte has an interesting line of gaming notebooks these days, including their own brand of P-series laptops as well as the AORUS brand. 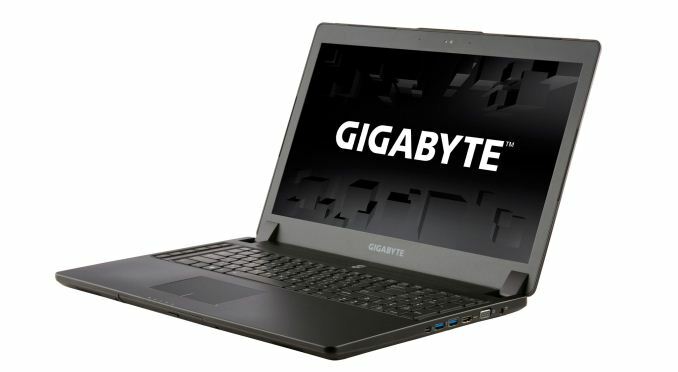 We’re in the process of reviewing the P35X v3, which packs a GTX 980M into a 0.82” thick 15.6” chassis, and now Gigabyte sends word that they have officially launched the big brother P37X with a 17.3” chassis in the North American market. It’s actually slightly thicker than the P35X, and the design language is very similar as well. That’s either good or bad depending on what you’re looking for in a gaming notebook. On the one hand it’s generally slimmer (0.9”) and lighter (6.17 lbs.) than competing notebooks from Alienware, ASUS, Clevo, and MSI; however, keeping things cool in a thinner chassis generally means either more noise from the fans, higher temperatures, or both. It’s also either a conservative and subdued looking design, or it’s boring – I tend to like less bling on my laptops, but others are happier with multi-colored keyboard backlighting and a more aggressive industrial design. Amazon and other retailers are carrying the Gigabyte P37X, and the base model comes with i7-4720HQ, GTX 980M 8GB, 8GB system RAM, and a 1TB HDD (no SSDs in the base model, though you can always add your own) for $1999. If you prefer a slightly upgraded build, the Gigabyte P37X-CF2 also has 8GB RAM and an i7-4720HQ, but it includes a 256GB mSATA SSD and a Blu-ray burner for $2499. So yeah, just buy the base model and pick up a pair of 512GB mSATA MX200 SSDs for $440 instead – and if you really want a Blu-ray burner, that can be arranged for the remaining $60. You’ll probably want to upgrade the RAM as well, as 8GB is a bit chintzy on a high-end gaming rig these days. Despite the odd pricing on the “upgraded” build, it’s good to see additional gaming notebook options, and for those that prefer a more subdued aesthetic the Gigabyte line might be exactly what you’re after. We’ll have the full review of the P35W v3 in the next week or two, so stay tuned. I would think the 980 would hurt battery life, right? I look forward to your full review. The Razer offerings are far too limited for my tastes. While I agree with Jarred and yourself, Windows (not the OS alone, developers are also responsible but their SDK for 8.1 isn't nearly as 'friendly' nor slick as OS X, Xcode, and it's relatively easy scaling solutions across OS X and iOS devices) isn't quite 'ready' for HiDPI displays ubiquitously yet. 1920/1080 right now makes perfect sense (especially for gaming on an 8 million pixel display with current mobile GPU's and the 'heat' Jarred refers to) compared to four times that. That said, I've owmed the MacBook Pro 15" rMBP 2012 since its release and purchased an updated Haswell this last year to replace my '11 17" MacBook Pro. At 44, the clarity of everything --- text to video, stills to the GUI/UIs of my main software. Extremely impressive having the entire 4k motion shot, pixel for pixel in the canvas while enjoying a UI in FCP X, Premier or AE is incredible on the iMac 5k but other than us geeks, it's a tough proposition to get folks to upgrade their sets or computer displays when they just bought the current TV for $419!! !